Hey Funny Names Wildheads! Welcome to this action packed jam-o-rama of the most whizzing, hissing, deep-sizzlin’ funny names of the week! Trying something new today. Bringing that Red Bull wham-bang aesthetic to our blog. You know, drawing in those younger demographics. You know how it goes. Anyway, moving straight on to the bidness side of things, we begin with Doris Deahardie, the lovely 100-year old lady who had the presence of mind to hire an able-bodied young male stripper for her centennial birthday. Deahardie, of Retford, Great Britain, reportedly picked out her own dancer and requested the “full monty” as it is sometimes called, or “the final countdown” as it is known in my house. Now, doesn’t that just warm the old heart? From stripper to miracles, we move to the Miracle on the Hudson, which is not a mid-80s Robin Williams movie, but rather a plane crash. Most people would consider that unfortunate, but hey, let’s call it a miracle, sure. We all of course remember the heroic actions of the greatly named Captain Chesley B. “Sully” Sullenberger III, but another so far overlooked figure emerged from the miracle this week, a Janis Krums. Mr. Krums took what is known as the most iconic photo in the aftermath of the crash, having happened to be in the neighborhood at the time. See the photos here. Would you like some manic comedy stylings with that? Are you smarter than a 4-year old? It’s a TV show that should be made, mostly because it could so easily embarrass overconfident dudes, but also because it could star “New Orleans Toddler” (how’s that for a boxing name) Anala Beevers. The young Ms. Beevers was recently admitted to Mensa, and not just because she’s adorable. She scored a solid 145 in her IQ test, which is pretty good. When I was four, I probably would have been mostly drawing pictures of poop on the test. Which explains my score of doo hundred. To return from that dark alley of the mind, let’s turn to Michael Cera. Oh yes, the happy-go-lucky actor. He always cheers everyone up with his happy-go-lucky acting and breezy fun movies. Like his new film Gregory Go Boom, in which he plays a paraplegic. Written and directed by Janicza Bravo, the film recently won the Sundance Film Festival short film award. So that’s happy-go-lucky at least. All right then. I’m going to call it a day here, before I disturb everyone. Goodbye! 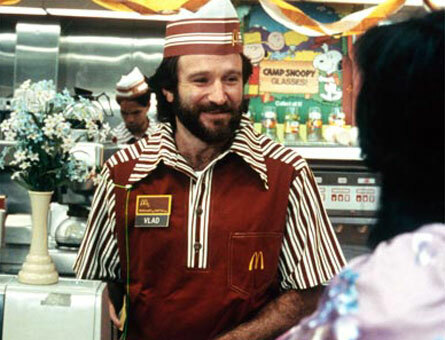 This entry was posted in Uncategorized and tagged fries, funny names, haha, humor, humour, news, robin williams. Bookmark the permalink. Everything about this post is brilliant! Sully the rock star. I can see it. I will only say…no comment. whoa, Arto. Keep it down! Lots of crazy here. Where do you find these um, interesting, human interest stories anyway? Deehardie sounds like quite the lady. Perhaps she could join Joanna Rohrback for a prancersise session or two? I especially love Michael Cera and his happy-go-lucky ways. New movie, you say? Will check it out. Actually, I think the Doris one was my link. Arto just made it sound about a billion times more awesome. He’s good at that. And I totally agree about the Michael Cera lines. So good!